Like the steamship, the railway predates the Victorian era. The start of the modern railway age is usually marked by the opening in 1825 of the Stockton & Darlington line. 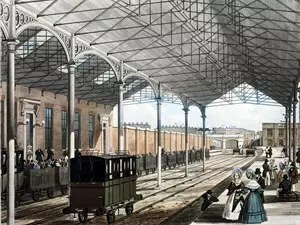 Other, mostly local, lines followed, the most important of which was the Liverpool and Manchester of 1830, famous for Robert Stephenson’s Rocket locomotive. With its multitube boiler, blast pipe exhaust, pistons connected directly to the driving wheels and its ability to haul its train at over 30 miles per hour, this machine set the standard for locomotive design. The warehouse at Liverpool Road, Manchester. The oldest surving railway warehouse in the world, this three storey building was built on the first inter-city route between Liverpool and Manchester in 1830. It brought food and goods from the port at Liverpool into the centre of Manchester. The first long distance lines were opened in the first years of Queen Victoria’s reign, the London and Birmingham in 1838, part of Brunel’s London to Bristol route the same year and the London and Southampton in 1840. A railway boom and mania followed during the 1840s, with promoters and speculators planning lines all over Britain. By 1845 2441 miles of railway were open and 30 million passengers were being carried. The railways, offering as they did new opportunities for travel and commerce, and breaking down social barriers in the process, were immediately popular, a popularity encouraged by acts of parliament that ensured that trains conformed to standards of speed and comfort and offered rates that were affordable by all. The spread of the railways also brought about, through time-tabling, a regularisation of time throughout Britain. Excursions and day trips, particularly to the seaside, became a familiar part of British social life. In 1851 many of the six million visitors to the Great Exhibition travelled by train to London in organised excursions. Queen Victoria made her first train journey on 13 June 1842 and then became a regular user of the rail network, for speed and convenience and because it gave her ample opportunity to show herself and her family to her subjects. Euston Station, showing its original wrought iron roof of 1837. But it was the railways that ensured London’s complete transformation. After all, this was the age of industrial revolution and the great city was never going to miss out. Euston station was built in 1837; Waterloo, Paddington, Victoria and the rest all followed shortly afterwards. In the 25 years from 1852 to 1877 the railways took over, as networks were laid that remain to this day. London would never look or feel the same again. The biggest impact of the railways was the way they revolutionised working life. The big, national railway networks were accompanied by local, commuter lines. These were ideal for the clerks and other lower-middle-class professionals who could not afford to live in the safer areas of central London – and who chose not to live in the cheaper areas, where crime was booming. Railways meant they could move to the suburbs. London Bridge and Fenchurch Street stations began running commuter services in the 1840s, servicing once far-off places like Deptford, Croydon and even Brighton.